A custom coil cord is the ideal solution for a wide range of applications where space or flexibility are concerns. 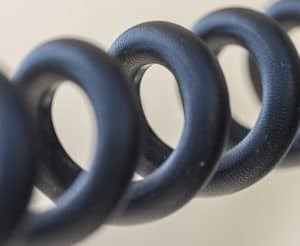 A custom coil cord, also known as a curly cord or retractable cable, is probably most familiar as a part of a home or business telephone…and for good reason. With a non-mobile phone, it is important for the cord to accommodate the user’s movements while in use. But when not in use, it’s more convenient when the cord takes up less space. These same features are beneficial for use with many other types of equipment, from medical devices to surveillance systems. What is a custom coil cord? The basic shape is essentially the same with all coil cords. They have straight sections at each end with a curled section in between. The ability to stretch and retract is determined by the diameter of the curled section and the material used to create the cable. Because they are able to stretch and retract, they are more resilient and take up less space than conventional cables. Stock coiled cord is available, but if you are interested in designing a cable that is a perfect fit for your equipment, a custom solution might be the answer. With a custom coil cord, you are able to select the conductor, jacketing, and additional materials as you would with any other custom cable. However, you are also able to dictate other elements that determine how the finished product will perform. The coiled section is the most common physical feature that is customized. Cable can be wound into coils from ¼ of an inch to 5 inches, depending on the desired length of the extended cord. But this isn’t the only feature that we pay attention to when designing a custom coil cord. The straight sections at each end of the cord are called tangents. Tangents are either perpendicular or axial, and should be taken into consideration when looking at functionality versus budget. For example, an axial tangent takes a little longer to manufacture, but it exits the coiled section of the cord along the centerline of the coil, which allows it to stretch along the same line as the rest of the cable. Not every custom coiled cable has to withstand the same stressors. The two main types of coiled cable are cycled and stationary. Stationary coiled cables are used to connected a device that is in a fixed location with one that moves. A cycled cable is used in applications where it must be extended and retracted continually without failing – think bar code scanners that are often used hundreds of thousands of times. Custom coil cords are a great solution when you need a cable that saves space while being flexible and durable. While many of the benefits of designing a custom coil cable are the same as when you create a non-coiled cable, there are a few additional features to take into consideration. If you are looking for a partner with the knowledge and experience to help you navigate designing a custom coil cord, contact Meridian Cable. We’d love to talk with you about your project.